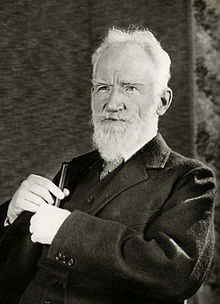 George Bernard Shaw (26 Julie 1856 – 2 November 1950) wis an Erse playwricht, creetic, polemicist an poleetical activist. His influence on Wastren theatre, cultur an politics extendit frae the 1880s tae his daith an ayont. He wrote mair nor saxty plays, includin major warks sic as Man and Superman (1902), Pygmalion (1912) an Saint Joan (1923). Wi a range incorporatin baith contemporary sateer an historical allegory, Shaw becam the leadin dramatist o his generation, an in 1925 wis awairdit the Nobel Prize in Leeteratur. Born in Dublin, Shaw muived tae Lunnon in 1876, whaur he struggled tae establish himsel as a writer an novelist, an embaurked on a rigorous process o sel-eddication. Bi the mid-1880s he haed acome a respectit theatre an muisic creetic. Follaein a poleetical awaukenin, he jynt the gradualist Fabian Society an becam its maist prominent pamphleteer. Shaw haed been writin plays for years afore his first public success, Arms and the Man in 1894. Influenced bi Henrik Ibsen, he socht tae introduce a new realism intae Inglis-leid drama, uisin his plays as vehicles tae disseminate his poleetical, social an releegious ideas. Bi the early twentiet century his reputation as a dramatist wis secured wi a series o creetical an popular successes that includit Major Barbara, The Doctor's Dilemma an Caesar and Cleopatra. Shaw's expressed views war eften contentious; he promotit eugenics an alphabet reform, an opponed vaccination an organised releegion. He coortit unpopularity bi denooncin baith sides in the First Warld War as equally culpable, an awtho nae a republican, castigatit Breetish policy on Ireland in the postwar period. Thir stances haed na lastin effect on his staundin or productivity as a dramatist; the inter-war years saw a series o eften ambeetious plays, that achieved varyin degrees o popular success. In 1938 he providit the screenplay for a filmed version o Pygmalion for that he received an Academy Awaird. His appetite for politics an controversy remeened undimeenished; bi the late 1920s he haed lairgely renoonced Fabian Society gradualism an eften wrote an spoke favourably o dictatorships o the richt an left—he expressed admiration for baith Mussolini an Stalin. In the feenal decade o his life he made fewer public statements, but conteena'd tae write proleefically till shortly afore his daith, aged ninety-fower, haein refuised aw state honours, includin the Order o Meerit in 1946. Syne Shaw's daith scholarly an creetical opeenion haes varied aboot his warks, but he haes regularly been ratit as seicont anerly tae Shakespeare amang Breetish dramatists; analysts recognise his extensive influence on generations o Inglis-leid playwrichts. The wird Shavian has entered the leid as encapsulatin Shaw's ideas an his means o expressin them. This page wis last eeditit on 10 Dizember 2018, at 07:28.